The Gartner Group reports workers spend on average between 30 minutes and two hours daily just searching for documents. Furthermore, it is estimated that data management and record keeping activities consume over 90% of the average workers time. Studies show that tasks related to creating, organizing, finding and analyzing information and data are significant time wasters and high costs are now associated with poor data management systems and processes. These problems will simply be amplified as organizations increase their volume of information, implement additional cloud-based record systems and move to a paperless organization. As the work force continues to evolve and globalize, more organizations are developing remote workforce strategies to save overhead costs, increase retention, improve productivity and lower carbon footprint. Although workers cite in telework studies higher productivity, they also cite challenges of accessing the necessary data to do their job. Having a centralized, well-organized system of accessing data on the shared drive assists mobile workers to get their work done efficiently whether at home, in the office or on the road. 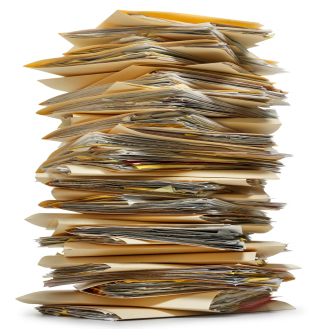 In addition to environmental impacts, paper is time consuming to manage. Studies indicate that of the paper filed, over 80% is never referenced again. One Xerox study showed that over 45% of the office paper that is discarded was thrown out on the same day it was printed. A great deal of time and cost is being wasted printing, sorting, purging, scanning and filing paper. Having documents well organized and filed on the shared drives supports users to stop printing, minimize scanning and confidently rely on electronic systems to find documents. According to an AIIM research study, 53% of organizations are still reliant on manual processes for e-discovery searches across file shares, email and physical records. Having sound file structures and document naming conventions increases the likelihood that users will find, and more importantly use, the information they need. The lifecycle cost of one paper document can be over $20. Also cited in the AIIM research study are compliance risks associated with poor records management. Thirty one percent of respondents report that poor electronic records-keeping is causing problems with regulators and auditors and 14% of respondents incurred fines or bad publicity. Workers who deal with mis-managed shared drives have difficulty to find and produce accurate records in a timely fashion for data calls, inspections, audits or FOIA requests. A good, well-organized shared drive prepares organizations for migration into document and content management systems. Although cloud-based document and content management systems offer robust searching functionality, with lack of good taxonomy and file structure strategy, searching documents will be difficult, and search results will be limited. Further if shared drives are full of unnecessary and outdated data, migrating these records into new systems continues the same issue of sorting through unwanted information. It is essential to have identified a well-defined file structure and taxonomy as well as relevant and active data to migrate into new document and content management system. Executives report wasting the equivalent of 5 weeks a year trying to find lost files, addresses, correspondence and reports.